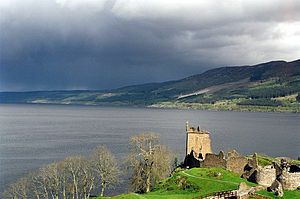 Loch Ness (Scots Gaelic: Loch Nis) is a mukkil an deip freshwattir loch in the Hielands o Scotland. It stents for aboot 37 kilometer (23 mile) soothwast frae Innerness. It haes a surfass aurie o 56.4 km2 (21.8 sq mi), makkin it the seicont-mukkilest Scots loch eftir Loch Lomond. Houaniver, awin til its gret deipth it is the mukkilest bi vollum. Its aiverage deipth is 132 meter (433 fit) an its deipest pynt is 230 m (755 ft) deiper as the heicht o Lunnon's weil-kent BT Tour. It inhauds mair fresh wattir as aw the lochs in Ingland an Wales pit thegither, an is the mukkilest bodie o wattir on the Gret Glen Blain, whilk rins frae Innerness in the north til Fort Wulliam in the sooth. At its soothren end, Loch Ness is linkit til Loch Oich bi the River Oich an a bit o the Caledonian Canal. At the northren end is the Bona Narraes that apens oot intil Loch Dochfour, whilk feids the River Ness, an a forder bit o canal up til Innerness. It is ane o a series o mirkie wattirs in Scotland; its wattir veisibilitie is gey law awin til a fek o turf in the surroondin yird. Loch Ness is best kent for the ledged sichtins o the Loch Ness Monster, eik-named "Nessie". At Drumnadrochit is "The Loch Ness Centre" whilk luiks intil the naitural historie o Loch Ness. Boat cruises operate frae sindrie steids on the loch shore, giein veisitors the chance ti luik for the "Loch Ness monster". Urquhart Castil ligs on the wastren shore, 1 mile eist o Drumnadrochit. Thar bes licht-houses at Lochend (Bona Licht-houss) an Fort Augustus. The anerlie iland on Loch Ness is Cherrie Iland, whilk ligs at its soothwastren end, naur Fort Augustus. It is a crannóg, whilk is a kynd o manmakkit iland. Maist crannogs war biggit durin the Airn Eild. Thar wis umwhyl a seicont iland (Dug Iland), whilk wis drount whan the wattir level wis heez'd durin the biggin o the Caledonian Canal. ↑ "Bathymetrical Survey of the Fresh-Water Lochs of Scotland, 1897–1909". National Library of Scotland. Archived frae the oreeginal on 2007-02-08. ↑ 2.0 2.1 "Ness, Loch". The Gazetteer for Scotland. Retrieved 2010-02-09. ↑ The Loch Ness Centre. ↑ 4.0 4.1 O. Blundell (1909) Proceedings of the Society of Antiquaries of Scotland, Vol 43, pp. 159-164.